Please note that in this screenshot, the Background of the ‘Virtual’ portion of the Drawing Quad was changed from the usual/customary black to a light blue, which better-represents the sky. Such a change may be applied to any Virtual View (i.e. in the Drawing Quad, Lighting Quad and Virtual View tabs, as well as in the Render Wizard) but please note that it has no impact on renderings; in order for the background to appear blue in renderings. 1. Right-click in the Virtual View. 2. Select View Options from the pop-up menu that appears. 3. In the new window that opens switch to the Options tab. 4. Click the Background Color button in the upper-right corner of the window to open the Color window. 5. Choose a pre-defined color or define a custom color; when done, click OK to close the Color window. 6. Click OK once again to close the View options. 1. Working in Drawing Wireframe, select the tent or venue. 3. Switch to the Sidedness tab. 4. From the Sidedness drop-down, select Double Sided. Since the tent in this example had to be broken in to its component surfaces, simply clicking on it will not select them all. As such, the tent was singled out in the drawing by making the Venue layer current and changing to the “(Current Layer Only)” scene. Once the tent was the only thing visible, it was easy to select everything and follow the steps above to apply the Double Sided setting. The roof of the tent appears transparent despite the fact that it was set to be double sided. This is due to the fact that the Material that was chosen for it (Plastic 8—again, please see last month’s tip) is transparent on its own. Please note that the lighting design for this event was cre- ated in wysiwyg… after the initial/basic lighting was added in Vivien, the file was opened in wysiwyg and real lights were added; wysiwyg’s Design Mode was used to create the looks in the renderings below. Since this event takes place over the course of a day, starting in the morning and ending after nightfall, the producers have asked for sample renderings, which will show them what the event will look like at various times during the day. Using Vivien’s Environmental Lighting rendering feature, we can create such renderings easily. Rendering with Environmental Lighting is a three-step process: first, we must tell Vivien where North is in relation to our scene; second, we must tell Vivien where (i.e. on Earth) our show is taking place; and third, we must set the correct options in the Render Wizard. We will look at each of these steps in turn. The reason we need to tell Vivien where the North Pole is located in relation to our scene is that Vivien’s render engine needs this information in order to determine the correct position of the sun (or moon) for the date and at the time at which the image is rendered. Without this information, the renderer assumes a random (and thus most likely incorrect) position for the sun. 1. Switch to Drawing Wireframe/Plan View. 2. From the Tools menu select Define North. 3. Click to place the first point of the compass. 4. When you drag away from the first point, you will see the arrow of the compass (i.e. the North direction) following the cursor. Click again to place the second point of the compass, and thus tell Vivien where North is located. If you happened to make a mistake in where you defined the North direction, please repeat the steps above to re-define it. Unlike other objects, the compass cannot be selected; to remove it completely, access the Tools menu and select Clear North. 1. From the Options menu, select Document Options. Switch to the Regional Settings tab. 2. Select a country and city from the available drop-down menus. If the location is not listed, check the Custom option and enter the Latitude, Longitude and Time Zone information into the available fields. Latitude and Longitude data for any location on Earth may be obtained from websites such as http://itouchmap.com/latlong.html. 1. Check the Environmental Lighting option to enable rendering with Environmental Lighting. 2. Set the date of the event, and the time. 3. Set the Light Quality slider to the desired position: “Clear Sky” will provide a light blue color for the rendered sky, whereas “Overcast” will create a blue-gray-colored sky. 4. The Soft Shadow option/setting instructs the render engine how to render shadows created by sunlight—with a hard or soft edge. Ideally, in Step 5 of the Render Wizard, Radiosity should be enabled when Environmental Lighting is used. This will ensure that if any sunlight or moonlight enters the event space through windows and/or doors, the effect this light has on the inside of the space is rendered correctly. A Medium quality / 2 Bounce setting provides the best quality rendering when considering the time the rendering takes to complete. Also in Step 5 of the Render Wizard, Ambient Light should be disabled. 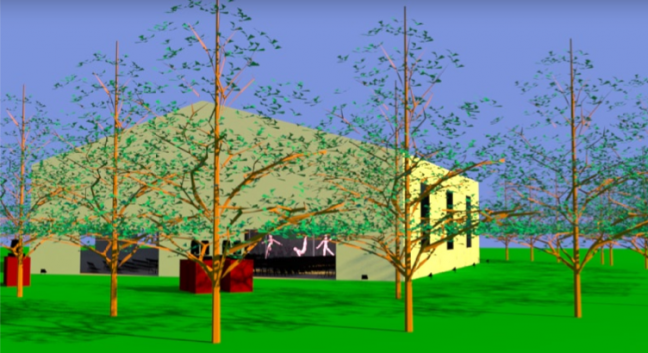 This will ensure that ambient light does not add to the amount of sunlight or moonlight both inside and out- side the event space, and thus, a more realistic rendering is achieved. Antialiasing should also be enabled (Step 8 of the Render Wizard), especially if Radiosity or Soft Shadow (or both) are enabled. The Fast setting should be used for most renderings, and only if the results are unsatisfactory should Best Antialiasing be chosen. Finally, on the next pages please find six renderings of this event, complete with information of what settings were used in the Render Wizard. In this rendering, we can see the long shadows created by the morning sun. None of the outside fixtures are going to be used until later in the day, once it starts getting dark. Inside, the main lights for the stage are on, as well as the audience lights. Note: for this rendering the audience lighting was turned off. At 2PM the sun is just past the azimuth, and therefore shadows created by it are very small. This can clearly be seen in the small patches of sunlight coming in through the windows at the west side of the tent. Since there is enough light in the tent coming through the roof and windows, the audience lights have been turned off. A storm has moved in, so the sky is overcast and blue-gray in color. As such, shadows are less prominent: please note the higher Soft Shadows setting below. The storm has moved away, and we have a beautiful sunset. On the back wall, we can see the setting sun coming through the windows; as you will see in the next rendering the beam from the sun continues on the ground where it leaves off at the top of the door. The pattern on the back wall is created by gobos from the fixtures at the back of the stage pointing into the audience. The audience lights are on, but only at 30%. At the same time, outside we can see the very long shadows created by the setting sun and the nice yellow glow on the west wall of the tent. Since there is still a little daylight left, the beams from the sky tracker fixtures are not well-defined. On a clear night, with the moon full, we can still discern the shadows created by the trees, tent and sky tracker stands. The beams of the sky trackers can clearly be seen how, and the colors used in the fixtures lighting up the outside of the tent are well-defined.